Have you been keeping track of the newest royal wedding? No, we're not talking about the British royals. We're talking about the monarchs of horror, Frankenstein and his bride. You might have thought these two were always married. In actuality, they had a rocky first date as often happens on blind dates. Honestly, the supposed Bride of Frankenstein reacted to her intended partner with a piercing scream. Her blind date then went on to run to the lab and tried to blow up the entire building. Now we've seen plenty of reality television but this level of drama always seems to be missing from most dating shows. 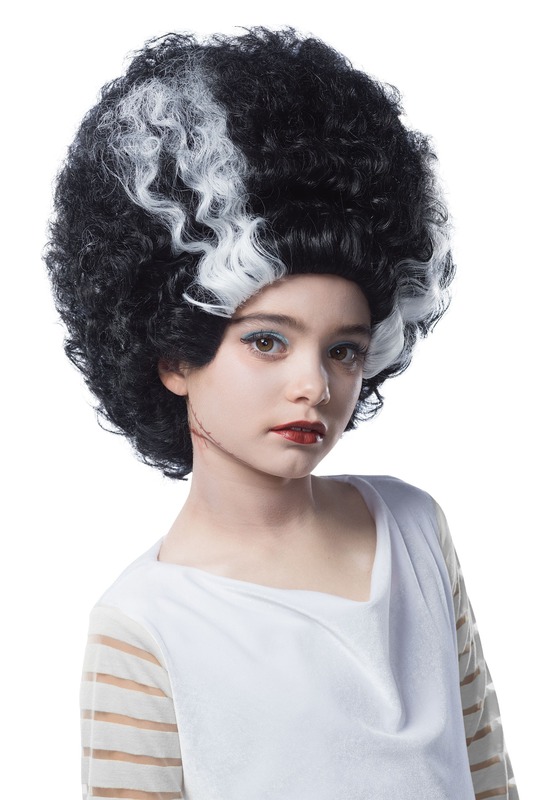 If you're ready to finally see this star-crossed pair get together, show your enthusiasm to the world with this Bride of Frankenstein wig! This black and white wig will tower over your head to make you into the infamous bride. Pair it with the white dress and you'll be ready for some silver screen drama. If you're ready to head out into the public as this classic character, you'll have to communicate in other ways than you're used to. That's right, no more hissing like an angry goose. Use your words. Modern life might be a little tricky but we all know you've been shocked before!